Took a bit of trial and error to hang evenly as the mounting hooks are not located exactly the same position for each of the three pieces. Otherwise, it’s a nice set. 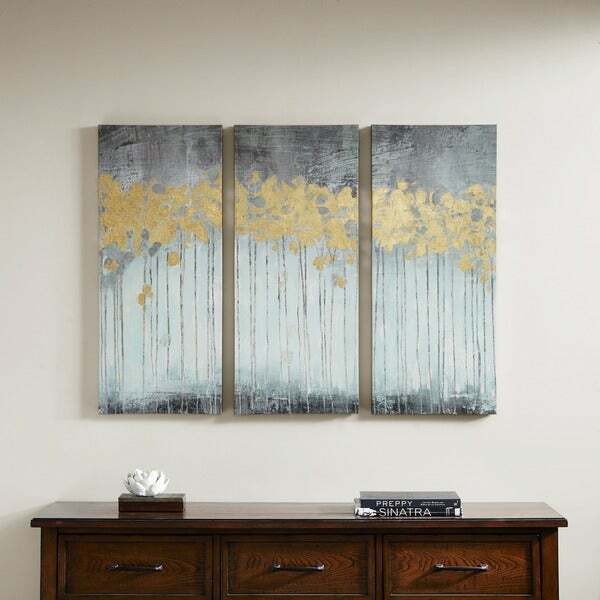 Grey forest is a triptych set will add style and sophistication to your living room. The set incorporates a beautiful blues and greys with hand applied gold foiling for added dimension. This is a beautiful three piece set perfect over an arched fireplace in a large room. As indicated in other reviews, this is really more in the blue tones than grey and I bought it based on those reviews hoping for a darker blue and pale aqua blend which is what I received. The photo on my monitor was very accurate. The foil is a nice accent that ties in with any tan or antique brass elements in the room and does not overwhelm the piece. As for the construction, I have bought several gallery mounted prints for a remodel and this selection is by far the best quality for the price. Each piece is heavier than expected and requires careful hanging and leveling. I placed mine at just under two inches apart and it works well but required several attempts to get them level. Two thumbs up- I would not hesitate to recommend or repurchase. My contractor, who is knit picky said this set knocked it out of the park. Great set for our living room. 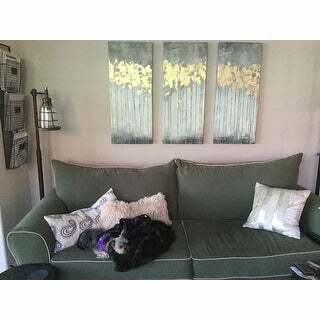 Was looking for artwork to pull together our charcoal grey couch and accent chairs that had gold, grey and cream colors in it. These came on time and match the pictures well. The gold color in the canvas matches my dining set. Loved them! The set comes as described. I put them in the bedroom. This three piece canvas painting goes perfectly in my guest bedroom!! My shower curtain is dark grey and gold!so this painting adds a final touch to the room!! This canvas was exactly what my living room needed. Perfect size. There is a hint of blueish/green in the canvas but its ok with me. It adds contrast. This picture is really nice. My only problem with this picture is that the green over powers the grey color in the picture and it really doesn’t look grey and I was looking for a picture that was more so grey. I just received the set and it’s beautiful but the color is slightly gently less blue gray and is more ash grey. So I was a little disappointed at the muted color when I was hoping it would give a little more of a pop of color above the tree line. But otherwise it’s solid and well-made. I love these paintings. We actually offset them an inch each and they are wonderful. I love this piece. I bought it for my living room and it pulled everything together. The colors are vibrant and with a few silver and gold accessories my living room came together. I looked for months to find the right wall painting to pull it all together and this one was it! 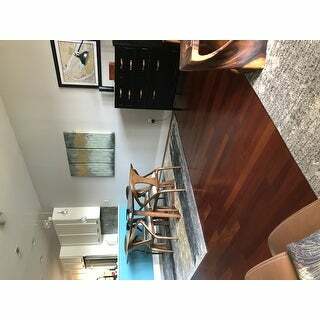 The pieces look great and exactly like the picture but it is definitely more teal and has a green tint rather than being a true blue. Also, the hooks on the back weren’t in the same spot on each one so you either have to remove them and put back in or be very careful with measuring when hanging. Overall it worked good in our house and I really like it. Look just like the picture, and have worked well for my living room. I put the canvas in my living room. Its exactly how it looks in the picture. I love it! I looks perfect in my living room. Also, the price is a great deal. I like this set and it looks nice, but it just doesn't seem as vivid in terms of the colors that I would have liked to have seen. Beautiful. Exactly as pictured. I spaced mine a few more inches apart to cover more surface area. It looks great and I love how neutral the colors are. Hangs on my living room wall. Looks perfect there. "What are the exact colors? I want something with blue and white in it." "Are these suitable for outdoor use?" I would not use Canvas Prints for outdoor use.